El Rincón de Monasterio & SPA, is a beautiful corner of relaxation and romance, located in Monasterio, a quiet and beautiful town belonging to the Natural Park of the Sierra Norte de Guadalajara. Its privileged location, just over an hour from Madrid; its beautiful natural environment and its tranquility, make it the perfect place to escape with your partner and to escape stress and daily routine, enjoying absolute privacy. The Monastery Corner is formed by a set of 8 rural lodgings; all of them different and totally independent; characterized by its unique charm. These, in addition to being fully equipped, and offering all the comforts of a modern home; They offer a magical, rustic and romantic atmosphere; where everything has been taken care of down to the last detail to make your stay unforgettable. The accommodations at Rincón de Monasterio are spacious and comfortable. They all have individual heating; a spacious living room with sofa, wood or pellet fireplace, flat screen TV and DVD. The kitchens are equipped with a microwave, refrigerator, dishwasher, microwave and a wide range of kitchenware. 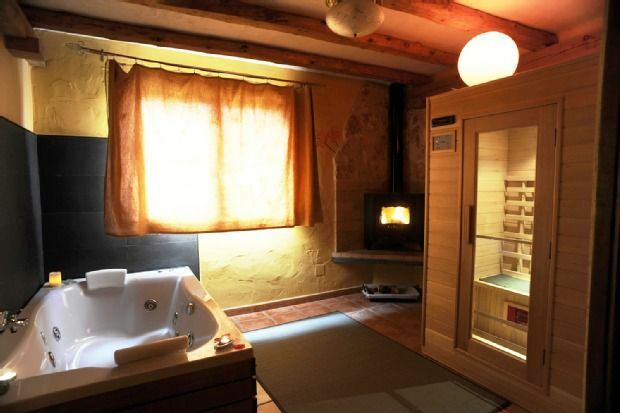 The bedrooms have beds between 1.50 and 1.80 m. To this we must add the uniqueness of having jacuzzi and chromotherapy all of them; and those of higher category, SPA with: jacuzzi; Chromotherapy, Tantra Divan and sauna. All have a full bathroom and some toilet. In the price of the reservation of accommodation are included as added values: small cold continental breakfast which is replenished daily; daily firewood load for chimneys; WIFI; amenities for the bathroom and Jacuzzi; towels and bathrobes in bathrooms and spas; reception service; video library and board games. To complete the experience and enjoy the outdoors during the summer, do not miss the fantastic and refreshing outdoor heated pool, with exclusive access for our guests! In addition we will be happy to inform you of routes and places of interest to visit in the wonderful surroundings and surroundings of the Sierra Norte de Guadalajara. As a perfect complement, enjoy our massage service and Spa treatments; our assortment of getaways; our dinners and romantic details to pamper your partner. In El Rincón de Monasterio, everything is taken care of so that you and your partner can enjoy an authentic Romantic Getaway. Enjoy a moment of intimacy as a couple, framed in a unique environment. Do not hesitate to consult us personally about prices; additional and complementary services; offers ... we will be happy to assist you personally! PROMOTION PACK ROMANTIC ESCAPE - RELAX - Tired of stress, work, noise ....? Escape with your partner! Enjoy a getaway in a place surrounded by nature and crystalline streams. Let yourself be seduced by its sunset, relax with a good massage, walk among the trees ... and when you return home ... surprise your partner with an intimate evening with a romantic dinner. Offer during the week (two nights for two people) Bed and breakfast Relaxing massage for 90 min (45 min each) Facial mask Romantic dinner, candles, rose petals. From 350 VAT included ..